Not to be confused with Coefficient of variation or Coefficient of correlation. Ordinary least squares regression of Okun's law. 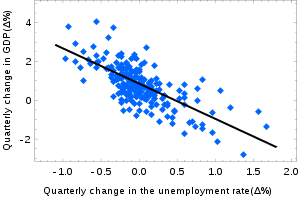 Since the regression line does not miss any of the points by very much, the R2 of the regression is relatively high. 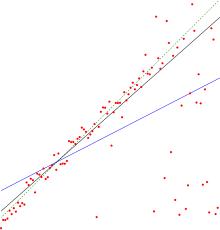 Comparison of the Theil–Sen estimator (black) and simple linear regression (blue) for a set of points with outliers. Because of the many outliers, neither of the regression lines fits the data well, as measured by the fact that neither gives a very high R2. In statistics, the coefficient of determination, denoted R2 or r2 and pronounced "R squared", is the proportion of the variance in the dependent variable that is predictable from the independent variable(s). It is a statistic used in the context of statistical models whose main purpose is either the prediction of future outcomes or the testing of hypotheses, on the basis of other related information. It provides a measure of how well observed outcomes are replicated by the model, based on the proportion of total variation of outcomes explained by the model. There are several definitions of R2 that are only sometimes equivalent. One class of such cases includes that of simple linear regression where r2 is used instead of R2. When an intercept is included, then r2 is simply the square of the sample correlation coefficient (i.e., r) between the observed outcomes and the observed predictor values. If additional regressors are included, R2 is the square of the coefficient of multiple correlation. In both such cases, the coefficient of determination normally ranges from 0 to 1. There are cases where the computational definition of R2 can yield negative values, depending on the definition used. This can arise when the predictions that are being compared to the corresponding outcomes have not been derived from a model-fitting procedure using those data. Even if a model-fitting procedure has been used, R2 may still be negative, for example when linear regression is conducted without including an intercept, or when a non-linear function is used to fit the data. In cases where negative values arise, the mean of the data provides a better fit to the outcomes than do the fitted function values, according to this particular criterion. Since the most general definition of the coefficient of determination is also known as the Nash–Sutcliffe model efficiency coefficient, this last notation is preferred in many fields, because denoting a goodness-of-fit indicator that can vary from -∞ to 1 (i.e., it can yield negative values) with a squared letter is confusing. When evaluating the goodness-of-fit of simulated (Ypred) vs. measured (Yobs) values, it is not appropriate to base this on the R2 of the linear regression (i.e., Yobs= m·Ypred + b). The R2 quantifies the degree of any linear correlation between Yobs and Ypred, while for the goodness-of-fit evaluation only one specific linear correlation should be taken into consideration: Yobs = 1·Ypred + 0 (i.e., the 1:1 line). is to 1. The areas of the blue squares represent the squared residuals with respect to the linear regression. The areas of the red squares represent the squared residuals with respect to the average value. A data set has n values marked y1,...,yn (collectively known as yi or as a vector y = [y1,...,yn]T), each associated with a predicted (or modeled) value f1,...,fn (known as fi, or sometimes ŷi, as a vector f). Define the residuals as ei = yi − fi (forming a vector e). where n is the number of observations (cases) on the variables. In this form R2 is expressed as the ratio of the explained variance (variance of the model's predictions, which is SSreg / n) to the total variance (sample variance of the dependent variable, which is SStot / n). 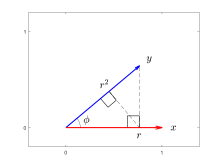 are obtained by minimizing the residual sum of squares. data values of the dependent variable. where the covariance between two coefficient estimates, as well as their standard deviations, are obtained from the covariance matrix of the coefficient estimates. data values. In this case, the value is not directly a measure of how good the modeled values are, but rather a measure of how good a predictor might be constructed from the modeled values (by creating a revised predictor of the form α + βƒi). According to Everitt (p. 78), this usage is specifically the definition of the term "coefficient of determination": the square of the correlation between two (general) variables. R2 is a statistic that will give some information about the goodness of fit of a model. In regression, the R2 coefficient of determination is a statistical measure of how well the regression predictions approximate the real data points. An R2 of 1 indicates that the regression predictions perfectly fit the data. Values of R2 outside the range 0 to 1 can occur when the model fits the data worse than a horizontal hyperplane. This would occur when the wrong model was chosen, or nonsensical constraints were applied by mistake. If equation 1 of Kvålseth is used (this is the equation used most often), R2 can be less than zero. If equation 2 of Kvålseth is used, R2 can be greater than one. In all instances where R2 is used, the predictors are calculated by ordinary least-squares regression: that is, by minimizing SSres. In this case R2 increases as we increase the number of variables in the model (R2 is monotone increasing with the number of variables included—i.e., it will never decrease). This illustrates a drawback to one possible use of R2, where one might keep adding variables (Kitchen sink regression) to increase the R2 value. For example, if one is trying to predict the sales of a model of car from the car's gas mileage, price, and engine power, one can include such irrelevant factors as the first letter of the model's name or the height of the lead engineer designing the car because the R2 will never decrease as variables are added and will probably experience an increase due to chance alone. This leads to the alternative approach of looking at the adjusted R2. The explanation of this statistic is almost the same as R2 but it penalizes the statistic as extra variables are included in the model. For cases other than fitting by ordinary least squares, the R2 statistic can be calculated as above and may still be a useful measure. If fitting is by weighted least squares or generalized least squares, alternative versions of R2 can be calculated appropriate to those statistical frameworks, while the "raw" R2 may still be useful if it is more easily interpreted. Values for R2 can be calculated for any type of predictive model, which need not have a statistical basis. are unknown coefficients, whose values are estimated by least squares. The coefficient of determination R2 is a measure of the global fit of the model. Specifically, R2 is an element of [0, 1] and represents the proportion of variability in Yi that may be attributed to some linear combination of the regressors (explanatory variables) in X.
) between the response variable and regressors). An interior value such as R2 = 0.7 may be interpreted as follows: "Seventy percent of the variance in the response variable can be explained by the explanatory variables. The remaining thirty percent can be attributed to unknown, lurking variables or inherent variability." A caution that applies to R2, as to other statistical descriptions of correlation and association is that "correlation does not imply causation." In other words, while correlations may sometimes provide valuable clues in uncovering causal relationships among variables, a non-zero estimated correlation between two variables is not, on its own, evidence that changing the value of one variable would result in changes in the values of other variables. For example, the practice of carrying matches (or a lighter) is correlated with incidence of lung cancer, but carrying matches does not cause cancer (in the standard sense of "cause"). In case of a single regressor, fitted by least squares, R2 is the square of the Pearson product-moment correlation coefficient relating the regressor and the response variable. More generally, R2 is the square of the correlation between the constructed predictor and the response variable. With more than one regressor, the R2 can be referred to as the coefficient of multiple determination. In least squares regression, R2 is weakly increasing with increases in the number of regressors in the model. Because increases in the number of regressors increase the value of R2, R2 alone cannot be used as a meaningful comparison of models with very different numbers of independent variables. 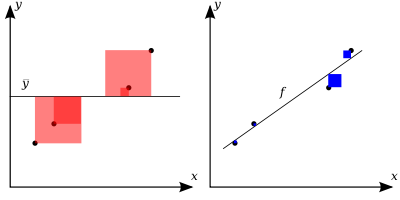 For a meaningful comparison between two models, an F-test can be performed on the residual sum of squares, similar to the F-tests in Granger causality, though this is not always appropriate. As a reminder of this, some authors denote R2 by Rq2, where q is the number of columns in X (the number of explanators including the constant). where Xi is a row vector of values of explanatory variables for case i and b is a column vector of coefficients of the respective elements of Xi. depends only on y, the non-decreasing property of R2 follows directly from the definition above. is equivalent to maximizing R2. When the extra variable is included, the data always have the option of giving it an estimated coefficient of zero, leaving the predicted values and the R2 unchanged. The only way that the optimization problem will give a non-zero coefficient is if doing so improves the R2. there are enough data points to make a solid conclusion. where p is the total number of explanatory variables in the model (not including the constant term), and n is the sample size. where dft is the degrees of freedom n– 1 of the estimate of the population variance of the dependent variable, and dfe is the degrees of freedom n – p – 1 of the estimate of the underlying population error variance. Adjusted R2 can be interpreted as an unbiased (or less biased) estimator of the population R2, whereas the observed sample R2 is a positively biased estimate of the population value. Adjusted R2 is more appropriate when evaluating model fit (the variance in the dependent variable accounted for by the independent variables) and in comparing alternative models in the feature selection stage of model building. The coefficient of partial determination can be defined as the proportion of variation that cannot be explained in a reduced model, but can be explained by the predictors specified in a full(er) model. This coefficient is used to provide insight into whether or not one or more additional predictors may be useful in a more fully specified regression model. will hardly increase even if the new regressor is of relevance. As a result, the above-mentioned heuristics will ignore relevant regressors when cross-correlations are high. to quantify the relevance of deviating from a hypothesized value. Click on the lasso for an example. In the case of logistic regression, usually fit by maximum likelihood, there are several choices of pseudo-R2. where D is the test statistic of the likelihood ratio test. It does not have any unit. : thus, Nagelkerke suggested the possibility to define a scaled R2 as R2/R2max. R2 = 0.998, and norm of residuals = 0.302. If all values of y are multiplied by 1000 (for example, in an SI prefix change), then R2 remains the same, but norm of residuals = 302. Other single parameter indicators of fit include the standard deviation of the residuals, or the RMSE of the residuals. These would have values of 0.151 and 0.174 respectively for the above example given that the fit was linear with an unforced intercept. The creation of the coefficient of determination has been attributed to the geneticist Sewall Wright and was first published in 1921. ^ Steel, R. G. D.; Torrie, J. H. (1960). Principles and Procedures of Statistics with Special Reference to the Biological Sciences. McGraw Hill. ^ Glantz, Stanton A.; Slinker, B. K. (1990). Primer of Applied Regression and Analysis of Variance. McGraw-Hill. ISBN 978-0-07-023407-9. ^ Draper, N. R.; Smith, H. (1998). Applied Regression Analysis. Wiley-Interscience. ISBN 978-0-471-17082-2. ^ Devore, Jay L. (2011). Probability and Statistics for Engineering and the Sciences (8th ed.). Boston, MA: Cengage Learning. pp. 508–510. ISBN 978-0-538-73352-6. ^ Barten, Anton P. (1987). "The Coeffecient of Determination for Regression without a Constant Term". In Heijmans, Risto; Neudecker, Heinz (eds.). The Practice of Econometrics. Dordrecht: Kluwer. pp. 181–189. ISBN 90-247-3502-5. ^ Colin Cameron, A.; Windmeijer, Frank A.G. (1997). "An R-squared measure of goodness of fit for some common nonlinear regression models". Journal of Econometrics. 77 (2): 1790–2. doi:10.1016/S0304-4076(96)01818-0. ^ Imdadullah, Muhammad. "Coefficient of Determination". itfeature.com. ^ Legates, D.R. ; McCabe, G.J. (1999). "Evaluating the use of "goodness-of-fit" measures in hydrologic and hydroclimatic model validation". Water Resour. Res. 35 (1): 233–241. doi:10.1029/1998WR900018. ^ Ritter, A.; Muñoz-Carpena, R. (2013). "Performance evaluation of hydrological models: statistical significance for reducing subjectivity in goodness-of-fit assessments". Journal of Hydrology. 480 (1): 33–45. doi:10.1016/j.jhydrol.2012.12.004. ^ Everitt, B. S. (2002). Cambridge Dictionary of Statistics (2nd ed.). CUP. ISBN 978-0-521-81099-9. ^ Kvalseth, Tarald O. (1985). "Cautionary Note about R2". The American Statistician. 39 (4): 279–285. doi:10.2307/2683704. JSTOR 2683704. ^ a b Shieh, Gwowen (2008-04-01). "Improved shrinkage estimation of squared multiple correlation coefficient and squared cross-validity coefficient". Organizational Research Methods. 11 (2): 387–407. doi:10.1177/1094428106292901. ISSN 1094-4281. ^ Richard Anderson-Sprecher, "Model Comparisons and R2", The American Statistician, Volume 48, Issue 2, 1994, pp. 113–117. ^ (generalized to Maximum Likelihood) N. J. D. Nagelkerke, "A Note on a General Definition of the Coefficient of Determination", Biometrika, Vol. 78, No. 3. (Sep., 1991), pp. 691–692. ^ "R implementation of coefficient of partial determination"
^ a b c Hoornweg, Victor (2018). "Part II: On Keeping Parameters Fixed". Science: Under Submission. Hoornweg Press. ISBN 978-90-829188-0-9. ^ Cox, D. D.; Snell, E. J. (1989). The Analysis of Binary Data (2nd ed.). Chapman and Hall. ^ Magee, L. (1990). "R2 measures based on Wald and likelihood ratio joint significance tests". The American Statistician. 44. pp. 250–3. doi:10.1080/00031305.1990.10475731. ^ Nagelkerke, Nico J. D. (1992). Maximum Likelihood Estimation of Functional Relationships, Pays-Bas. Lecture Notes in Statistics. 69. ISBN 978-0-387-97721-8. ^ Nagelkerke, N. J. D. (1991). "A Note on a General Definition of the Coefficient of Determination". Biometrika. 78 (3): 691–2. doi:10.1093/biomet/78.3.691. JSTOR 2337038. ^ OriginLab webpage, http://www.originlab.com/doc/Origin-Help/LR-Algorithm. Retrieved February 9, 2016. ^ Wright, Sewell (January 1921). "Correlation and causation". Journal of Agricultural Research. 20: 557–585. Gujarati, Damodar N.; Porter, Dawn C. (2009). Basic Econometrics (Fifth ed.). New York: McGraw-Hill/Irwin. pp. 73–78. ISBN 978-0-07-337577-9. Hughes, Ann; Grawoig, Dennis (1971). Statistics: A Foundation for Analysis. Reading: Addison-Wesley. pp. 344–348. ISBN 0-201-03021-7. Kmenta, Jan (1986). Elements of Econometrics (Second ed.). New York: Macmillan. pp. 240–243. ISBN 978-0-02-365070-3.